One of the key benefits of using a Digital Asset Management System is the ability to manage any rights that apply to the assets within it. This may vary from ensuring a photographer is credited whenever an image is used, to monitoring the use of a key asset that has only been licenced for use over a six month period. Our experience with Asset Bank tells us that most organisations will have slightly different requirements around rights management. In this article, we have a look at a few of the different approaches that are used. Some assets that arrive into a DAM system already have rights information stored in the embedded metadata layer of the file. This has typically been added by a photographer or by a Stock Photography site. 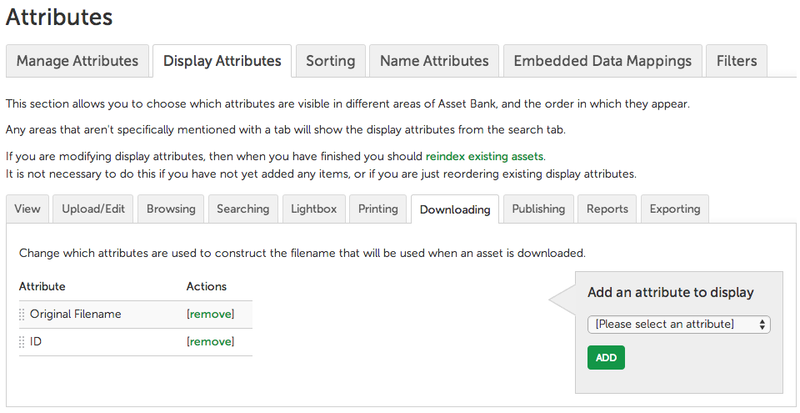 Some configuration is needed on the DAM to pull this information across at point of upload, posting it into the relevant ‘Usage Rights’ attribute field – ready for users to see. Whether rights information is extracted at point of ingest, or is added manually by the person uploading the file, the next step is to present this to the users of the system. It is essential that this information be highly visible to the users, as unlike other attributes, the detail here affects how the asset can be used. Below we can see that both Credit and Usage Rights fields appear high up in the attribute list and are highlighted. In addition, it is also useful to re-enforce this information further by repeating it at the point of download. As seen below, this is set by ticking the 'Show on Download' checkbox when editing the Usage Rights or Credit Attribute. You can also add some introduction text to help reiterate the action needed. This is actually a piece of content managed text that will only appear if there is an attribute shown at this point in the download. If we had an image that did not have any information in the credit attribute field, then neither the attribute nor the explanatory text would show up on download. Exactly what we want. You may have some assets that have been licensed at great expense, or that you worry may be used inappropriately. You would like users to be aware of these files, but require manual intervention to ensure that they are only used in the correct circumstances. To achieve this you can set these assets to have ‘Download after approval’ status, making them visible to users (though with a watermark applied to prevent screen-capture). Users can then review the usage rights and decide if they want to make a request. The relevant approvers are then notified and can decide to grant approval based on the reasoning provided, or reject the request, explaining why. This is a good way to handle such assets when communications alone through a ‘Usage Rights’ field is not enough. On occasion, there will be a licence agreement that is only valid for a limited period of time. As a result, you should set an expiry date for this at the point of upload. When this date arrives, your DAM system should automatically hide these assets from normal users, mark them as expired and optionally send emails to relevant parties who need to act on this. For example, emailing admin users who can then review the asset usage and decide if the asset was popular enough to warrant re-licencing for an extended period of time. Even though it is easy to inject rights information into the file as it leaves the DAM system, some clients have worried that this is not enough. They quite rightly say that it is not obvious from looking at the file on a desktop that rights in fact apply. A way of addressing this is for the DAM to automatically append the rights information text to the end of the file name at the point of download. E.g. a generic string like ‘Rights Apply’, or if all of your rights options are short enough (in terms of text length) then appending these. See below for an example of how this may look. To do this go here: Admin > Attributes > Display Attributes > Downloading and choose to add the credit and/or Usage Rights attributes from the drop-down on the right. This gives you a flavour for some of the ways rights information is managed and conveyed to users within Asset Bank. If you have any questions then please get in touch.